Jewish merchant-traveler of the tenth century. The little that is known about Ibrahim ibn Ya'ḳub is from his own account of the countries of the Slavs, and this is rather uncertain. He was a merchant and a slave-dealer, and perhaps he traveled besides on a diplomatic mission. His native land was most probably North Africa; it can scarcely have been Spain. In 965 he crossed the Adriatic Sea, went to the countries of the West Slavs, visited Prague and eastern Germany, and later on at Magdeburg met Bulgarian ambassadors at the court of Otto I. He traveled thence along the right bank of the Elbe, through Slavonic countries and farther northward to Schwerin, situated near the Lake of Schwerin. It is extremely difficult to find out which road he took, as the names of towns and places which he mentioned have been corrupted. His short, important, and cleverly written sketch of the Slavs is a most precious source for the history of the Slavs in general and the West Slavs in particular. It is worthy of note that thirty miles from Neuberg, near Thietmar, lbrahim found a "Saline of the Jews"—probably Dürrenbergen on the Saale. In speaking of the kingdom of Boleslạu of Bohemia, he mentions the Jewish merchants who came, together with Mohammedans, from Hungary. They carried away from Bohemia "flour, tin, and skins." Ibrahim mentions the Chazars, but says nothing about their being Jews; though he probably traveled only to those places where Jews lived and where he was sure of a friendly reception. His account is therefore also of interest for the study of the commercial activity of the Jews in the tenth century. It may be mentioned that the account of his journeys throws light also on the much-disputed nationality of the Old-Russians. 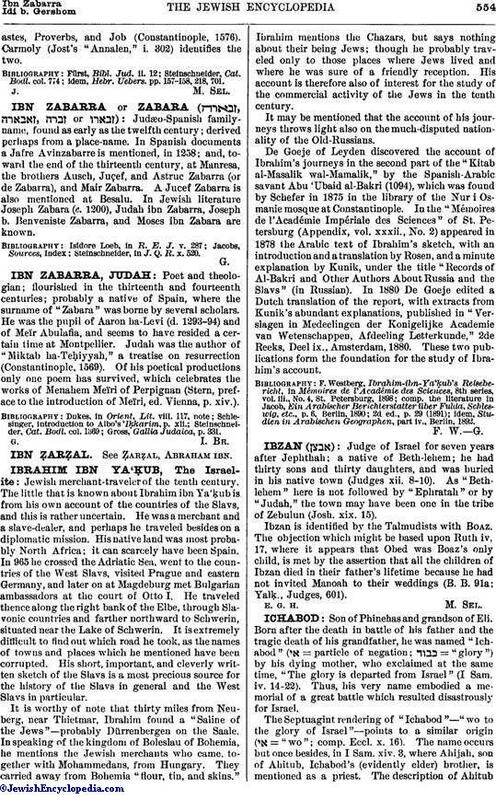 De Goeje of Leyden discovered the account of Ibrahim's journeys in the second part of the "Kitab al-Masalik wal-Mamalik," by the Spanish-Arabic savant Abu 'Ubaid al-Bakri (1094), which was found by Schefer in 1875 in the library of the Nur i Osmanic mosque at Constantinople. In the "Mémoires de l'Académic Impériale des Sciences" of St. Petersburg (Appendix, vol. xxxii., No. 2.) appeared in 1878 the Arabic text of Ibrahim's sketch, with an introduction and a translation by Rosen, and a minute explanation by Kunik, under the title "Records of Al-Bakri and Other Authors About Russia and the Slavs" (in Russian). In 1880 De Goeje edited a Dutch translation of the report, with extracts from Kunik's abundant explanations, published in "Verslagen in Medeelingen der Konigelijke Academie van Wetenschappen, Afdeeling Letterkunde," 2de Reeks, Deel ix., Amsterdam, 1880. These two publications form the foundation for the study of Ibrahim's account. idem, Studien in Arabischen Geographen, part iv., Berlin, 1892.